Dawn of the Planet of the Apes is a 2014 science fiction film directed by Matt Reeves. It stars Andy Serkis, Jason Clarke, and Gary Oldman. 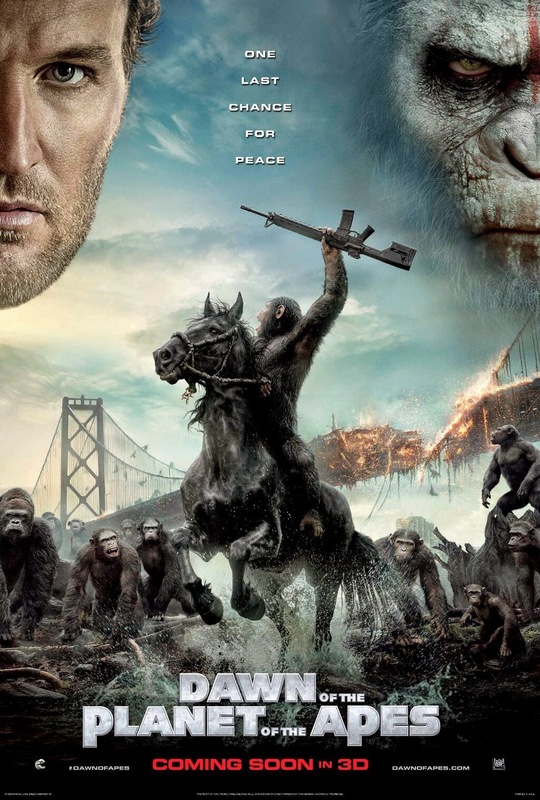 A sequel to the 2011 film Rise of the Planet of the Apes, it is the eighth theatrical film in the franchise. The film, which proved to be a box office hit, received highly positive reviews, with critics praising its special effects, story, direction, and acting. The story goes like this: A growing nation of genetically evolved apes led by Caesar is threatened by a band of human survivors of the devastating virus unleashed a decade earlier. They reach a fragile peace, but it proves short-lived, as both sides are brought to the brink of a war that will determine who will emerge as Earth's dominant species. Dawn of the Planet of the Apes is of action, drama, sci-fi genre, which runs for approximately 130 minutes. It's rated PG-13 in most countries for intense sequences of sci-fi violence and action, and brief strong language. I haven't seen the previous Planet of the Apes films but I must say that this movie is a good one. The humanistic behavior of the apes really gave the audience an understanding of their world and how they view the human race, which is not very different from how we humans view them. The use of emotions and empowering statements can be seen and heard throughout the film, which makes the film more engaging. And considering it is a relatively lengthy movie, the storyline did not feel dragging at all. The actors and the script were commendable as well. It goes without saying that the use of special effects was superb. Overall, it is a great film for everyone. The film is also available in 3D and Dolby Atmos.